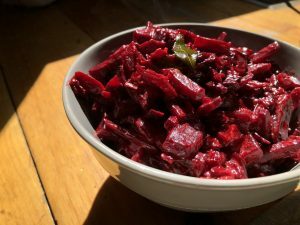 This dish has a lovely sweet flavor with just a hint of spice—beets have a higher sugar content than any other vegetable, and sugar is sometimes made from beets. 1. Sauté onions in oil on high with mustard seed and cumin seeds until onions are golden/translucent (not brown). 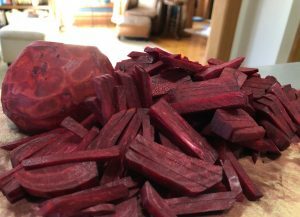 Add beets, salt, turmeric, lime juice, chilies, and curry leaves. 2. Lower heat to medium and add coconut milk. 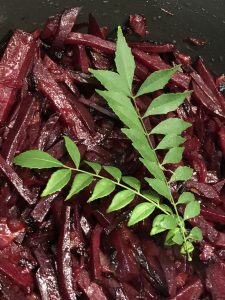 Cover and cook, stirring frequently, until beets are cooked through, about 20 minutes. 3. Remove cover and simmer, stirring, until well blended. Serve hot. Previous Previous post: Off to layout!